Happy 499 Birthday of the Reformation! 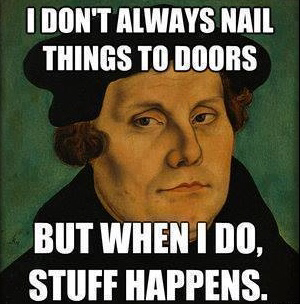 On October 31, 1517, pastor and professor Martin Luther nailed a list of 95 arguments on a church door in Germany. Back then that’s how you started a discussion. Luther’s arguments gained wide acceptance and were sent throughout Europe via the newly invented printing press. Central to his concern was that the Roman Catholic Church had deviated from the Bible’s simple teaching that you and I can be made right with God only by faith in God’s Son, Jesus Christ. The response to Luther’s points launched the Protestant Reformation 499 years ago, today.